Publication Information: RB Printers. 2012. Book Source: I received this book as a gift from a dear friend of my parents - a gift I asked for and one that I will always cherish. Favorite Quote: "I undertook to write our story to lessen my pain as well as to record what she was for her children and grandchildren ... I hope that this collection will enable them to know their exceptional grandmother better." This book is not one you can buy in a store or find online. It will not win awards or be on the bestseller list. Yet, it will always be one of my most treasured books. Let me tell you the story of this book and the amazing person that it is about. Tariq Hussain ("Uncle") and Nasim Tariq ("Aunty") were friends of my parents. I met them for the first time when we moved to their town. I was nine. From then on, they were part of our lives. Our parents hung out together. The kids all grew up together. We took care of each and watched out for each other. We were part of each other's joys and sorrows. As the kids turned into adults, we all moved in different directions - away to school, away for jobs, busy with starting families of our own. We saw each other less. Then, I learned that Aunty was suffering from Alzheimer's. She suffered from this disease for a decade before she passed away last year. Aunty was one of the most vibrant and committed people I have ever met. She was dedicated to her family, her friends, and the children of community - all of us have our stories of Aunty keeping watch over us, and for many of us, teaching us how to drive. She was also tireless in her devotion to community service. To see her suffering in this way from Alzheimer's was heartbreaking. Upon her death, Uncle compiled this book. It is a collection of photographs and memories from some of the people whose lives Aunty touched - her children, her grandchildren, other relatives, teachers, friends, and others. It is a beautiful tribute to a life well lived. It makes me cry to know that she is gone. It makes me smile to know that the legacy she left behind will always be. It makes me hope and pray that at the end of my life, I may leave a memory of such love. I am honored to have known her, and honored to be entrusted with this tribute to her. 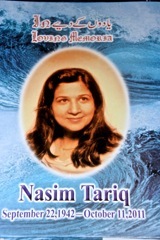 This a deeply touching commentary on the Book and on Nasim Aunty. Your practice of writing a blog for the books you raed should be adopted by all those who love reading.